The 2016 presidential campaign has gotten off to a slow start with voters. A majority of registered voters (58%) say they have given at least some thought to candidates who may run for president in 2016, but that is 10 points lower than at a comparable point in the 2008 campaign – the last time both parties had contested nominations. Yet, even at this early stage, the vast majority of voters (87%) say they care a good deal about who wins the presidency, and 72% say they care which party prevails. The latest national survey by the Pew Research Center, conducted March 25-29 among 1,500 adults, including 1,097 registered voters, finds stark differences in the way the possible Democratic and Republican fields are shaping up. Among the potential set of Democratic candidates, Hillary Clinton has a wide lead over other possible contenders, with fully 59% of Democratic and Democratic-leaning registered voters saying there is a good chance they would vote for her (86% say there is at least some chance they would). By contrast, no Republican stands out among the party’s crowded field: Of 10 possible GOP contenders asked about in the current survey, no candidate garners solid support from more than a quarter of Republican and Republican-leaning registered voters. Though Jeb Bush is widely known by Republican voters, just 23% say there is a good chance they would vote for him, while 41% say there is some chance; 25% say there is no chance they would vote for the former Florida governor. Mike Huckabee has similar levels of both recognition and support among Republican voters. By comparison, Marco Rubio, Scott Walker, Ted Cruz, Rand Paul and Ben Carson are all less well known, yet about as many GOP voters say there is a good chance they would vote for each of them as say this about Bush. Walker and Carson, in particular, are relatively unfamiliar potential candidates in the GOP race, but they fare well among the subset of Republican voters who have heard of them. Just 57% of Republican and Republican-leaning voters have heard of Wisconsin Gov. 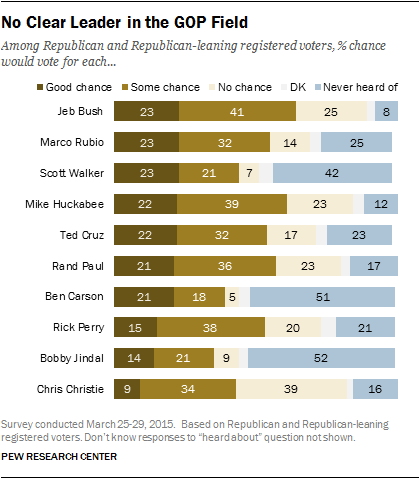 Walker, yet 23% say there is a good chance they would vote for him and just 7% say there is no chance. And Carson has name recognition only among 48% of GOP voters, but 21% say there is a good chance he would get their vote while just 5% say there is no chance of this. Chris Christie sits on the other end of the spectrum. Though relatively well-known (83% of GOP voters have heard of the New Jersey governor), there is little potential support for a Christie candidacy: Just 9% of GOP voters say there is a good chance they would vote for him, while nearly four-in-ten (39%) say there is no chance. In contrast to the tight Republican field, Hillary Clinton enjoys broad support among Democratic voters. Potential rivals for her party’s nomination have much softer levels of support among Democrats. 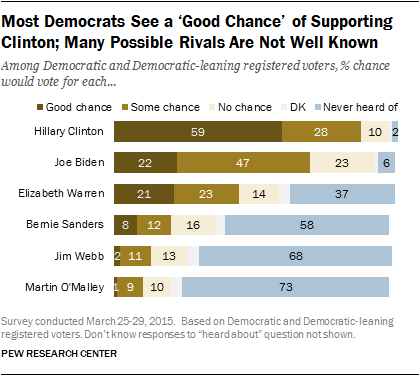 Fully 59% of Democratic voters say there is a good chance they would vote for Clinton, while an additional 28% say there is some chance (just 10% say there is no chance). Though Joe Biden is similarly well-known, just 22% say there is a good chance they would vote for him, while 47% say there is some chance of this (23% say there is no chance). The remainder of the potential Democratic field is much less well-known, with fewer than half of Democratic voters having heard of Bernie Sanders, Jim Webb or Martin O’Malley. Though there is the prospect of having both Hillary Clinton and Jeb Bush — two candidates related to recent presidents — in the 2016 race, there is little sign that this is a concern among their respective constituencies. Three-quarters (75%) of Republican voters say it doesn’t really bother them that the Bush family continues to play a large role in the GOP, while fully 88% of Democratic voters say they aren’t bothered by the Clintons’ continued role in the Democratic Party. At this stage in the race, 52% of voters say it is more important to them that a presidential candidate will compromise with the other party than that he or she will stick to their core values and positions (41%). Democratic voters, in particular, place value on candidates who will make compromises: 63% say this, compared with 31% who prioritize sticking to core values. Republican voters, by contrast, are more likely to value candidates who stick to their core values (57% vs. 35%). Within the party coalitions there are differences on these measures among each candidate’s supporters, particularly within the GOP. Among Republican voters, those who say there is a good chance they would vote for Bush are more supportive of a candidate who would compromise with the other party than are supporters of Cruz, Carson, Walker, or Paul. And half of voters (50%) say “experience and a proven record” is more important to them than “new ideas and a different approach” (43%). Republicans (59%) are more likely than either Democrats (46%) or independents (48%) to prioritize a proven record. As the 114th Congress nears its 100-day mark, overall views of the institution remain at a near-record low: Today, just 22% of Americans have a favorable view of Congress. Views of the GOP Congressional leadership are little changed over the last few months as well; Mitch McConnell continues to be viewed more unfavorably (38%) than favorably (23%), though many Americans say they have no opinion of the Senate majority leader. And John Boehner — who is substantially better known than his Senate counterpart — is viewed much more unfavorably (51%) than favorably (22%). Overall views of Barack Obama are little changed since the beginning of the year. Currently 46% approve of his job performance, while 47% disapprove. About half (51%) have a favorable view of Obama personally, while 46% have an unfavorable impression. These ratings have changed little since the beginning of last year. With the 2016 election more than a year and a half away, most voters have yet to fully engage with it—just 26% say they have given a lot of thought to the 2016 candidates, while 58% say they have given at least some thought. Overall, there is less interest in the campaign today than there was in March 2007 (when 68% had given the candidates at least some thought). At that stage of the 2008 election, all of the major candidates from both parties had formally announced their candidacies. As of today, just one 2016 candidate—Ted Cruz—has formally declared an intention to run. Today, Democrats, Republicans, and independents are about equally likely to say they have given thought to 2016 candidates. 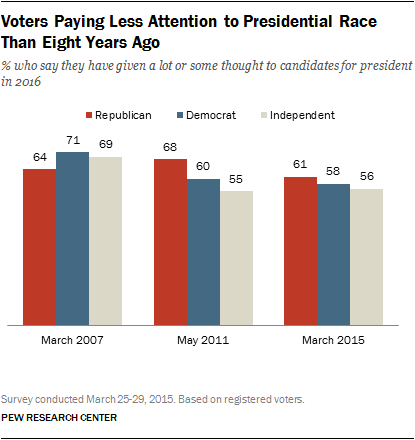 In March 2007, Democratic voters were somewhat more attentive to the election than their Republican counterparts (71% said they had given it at least some thought, compared with 64% of GOP voters). Among all registered voters, Hillary Clinton registers the greatest share of support. One-third (33%) of voters say there is a good chance they would vote for her, while an additional 19% say there is at least some chance. No more than 13% say there is a good chance they would vote for any single other candidate. However, among the field of possible candidates beyond Clinton, there is little differentiation at this early stage. This is particularly the case when it comes to possible GOP contenders: Jeb Bush, Mike Huckabee, Rand Paul, Ted Cruz, Marco Rubio, Scott Walker and Ben Carson all have about one-in-ten registered voters saying there is a good chance they would vote for them. At this stage, there is considerable variance in awareness of potential candidates. 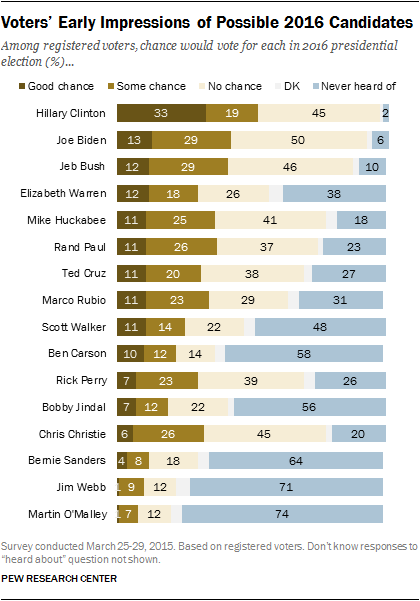 Virtually all voters have heard of Clinton, and Biden and Jeb Bush also are widely known. Among the other Republicans, Mike Huckabee, Chris Christie, Rand Paul, Ted Cruz, Rick Perry, and Marco Rubio are familiar to at least two-thirds of voters. But fewer than half of all voters have heard of Bobby Jindal, Ben Carson or Scott Walker. Among the other Democrats, just over half of voters have heard of Elizabeth Warren and less than a third say they are familiar with either Jim Webb or Martin O’Malley. No single GOP contender emerges as the clear preference of Republican and Republican-leaning registered voters. 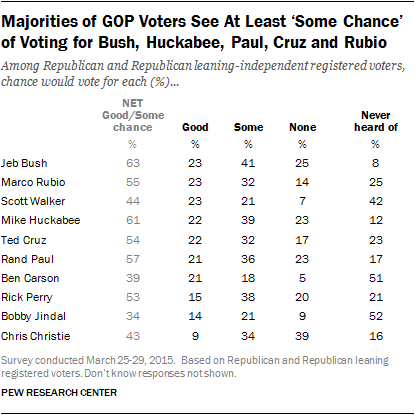 Jeb Bush is by far the best known among GOP voters, followed by Mike Huckabee, Chris Christie and Rand Paul. 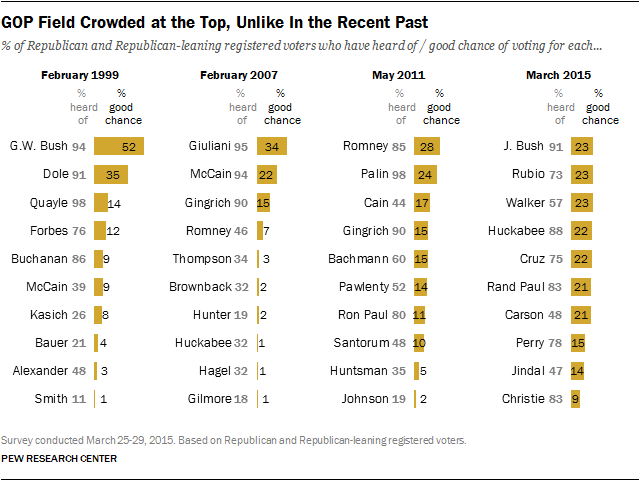 Jeb Bush and Mike Huckabee lead the pack, both in overall name recognition and in the proportion of GOP voters who say they would consider voting for each: 63% of Republican voters say there is at least some chance they would vote for Bush (23% good chance), with about as many (61%) saying this about Huckabee. Smaller majorities of GOP voters also say there is at least some chance they would vote for Rand Paul (57%), Marco Rubio (55%) and Ted Cruz (54%). Republican voters’ overall support for Scott Walker (44% at least some chance) and Ben Carson (39% at least some chance) lags behind these other candidates, but that is largely because of their relative unfamiliarity within the GOP base. Both men are known by fewer than six-in-ten Republicans; yet among those who are familiar with each candidate, both men have more support than other candidates. All of the possible Republican candidates asked about are better known among conservative Republican voters than among the party’s moderates and liberals. 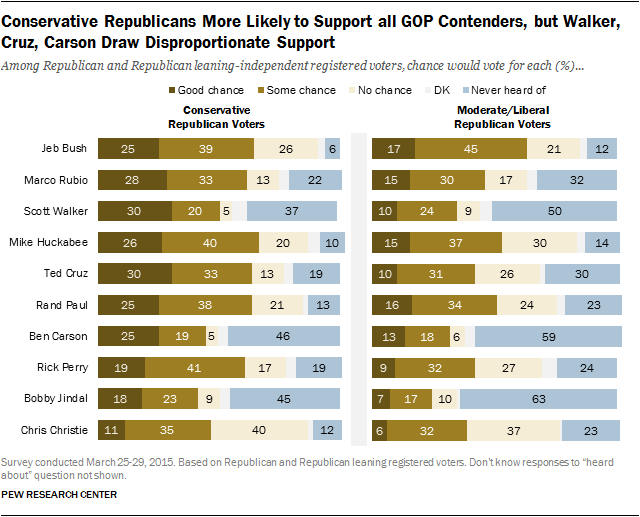 And most candidates draw more support among conservatives, although the differences are greater for some than others. For example, three-in-ten conservative Republican voters say there is a good chance they would vote for Ted Cruz (30%) or Scott Walker (30%), while just 10% of moderate and liberal Republicans say this about either man. About twice as many GOP conservatives (25%) as moderates and liberals (13%) say there is a good chance they would support Ben Carson. There is a narrower gap in support for Jeb Bush: 25% of conservative Republican voters and 17% of moderate and liberal Republican voters say there is a good chance they would vote for the former Florida governor. Chris Christie is relatively well known among both conservative and moderate and liberal Republican voters, but draws little support from either group. Just 11% of conservative Republicans and 6% of moderate and liberal Republicans say they see a good chance of supporting Christie; 40% and 37%, respectively, say there is no chance they would vote for the New Jersey governor. Currently, seven GOP presidential candidates draw potentially strong support from 20% or more Republican and Republican-leaning voters. At a slightly later point in the 2012 campaign (May 2011), there were only two candidates – Mitt Romney and Sarah Palin – for whom 20% or more GOP voters said there was a good chance of voting. Similarly, in February 2007, only two GOP candidates surpassed the 20% mark: 34% of Republican and Republican-leaning voters said there was a good chance they would support Rudy Giuliani and 22% said the same about John McCain. In February 1999, about half of Republican voters saw a good chance of voting for George W. Bush (52%) in the 2000 election, and 35% said there was a good chance they would vote for Elizabeth Dole. An overwhelming majority of Democratic and Democratic-leaning registered voters (86%) say there is either a good chance (59%) or some chance (28%) they would vote for Hillary Clinton. A majority (69%) of Democrats say there is at least some chance they would support Joe Biden, though just 22% say there is a good chance they would do so. About as many Democratic voters (21%) say there is a good chance they would vote for Senator Elizabeth Warren, despite being substantially less well known than the vice president. Bernie Sanders, Jim Webb and Martin O’Malley are little recognized, and fewer than a quarter of Democratic voters currently say there is any chance they would vote for them. Though support for Clinton is widespread among Democratic voters, there is a gender gap in the strength of her support among white Democratic voters. Overall, 62% of women and 54% of men say there is a good chance they would vote for Clinton. 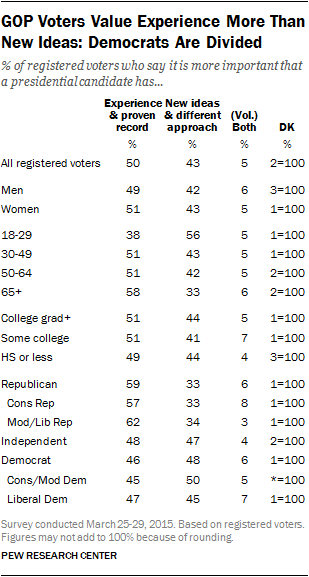 But these differences are particularly evident among whites: 61% of white Democratic women say there is a good chance they would vote for Clinton compared with 43% of white Democratic men. 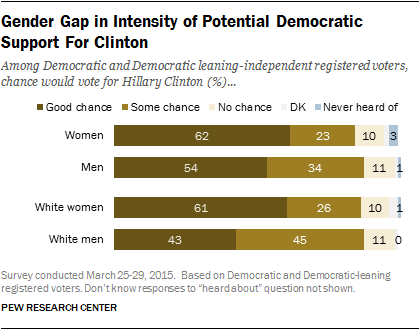 Conversely, more white Democratic men (45%) than women (26%) see some chance of voting for Clinton. Only about 10% in each group sees no chance of voting for her. 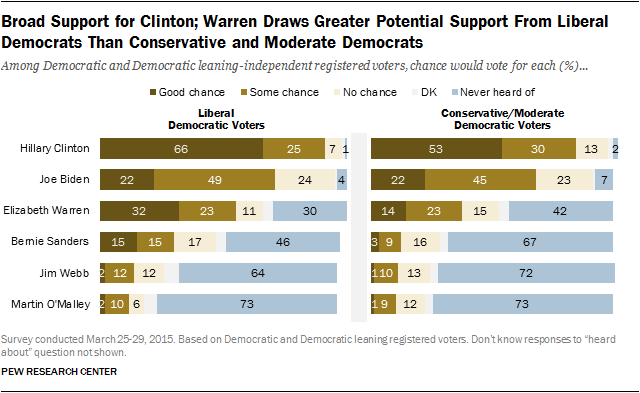 Support for Clinton is greater among liberal Democratic voters (66% of whom say there is a good chance they would vote for her) than among conservative and moderate Democratic voters (53% say this). Still, large majorities of both groups (91% of liberal Democratic voters and 83% of conservative and moderate Democratic voters) say there is at least some chance they would cast a ballot for her. Joe Biden garners about equal levels of support from both liberals and moderates in the party, while Elizabeth Warren has greater support among the party’s liberals. Nearly a third (32%) of liberal Democratic and Democratic leaning voters say there is a good chance they’d vote for her, while just 14% of conservative and moderate Democratic voters say this. To some extent, this reflects liberals’ greater familiarity with Warren: 70% of liberal Democratic voters have heard of Warren, compared with 56% of conservative and moderate Democrats. Democrats’ early preferences for the 2016 election are similar to those at a comparable point in the 2008 election in one respect: A large share of Democratic and Democratic-leaning voters say there is a good chance they would vote for Hillary Clinton. Nearly six-in-ten (59%) Democratic and Democratic-leaning voters say that today; 52% said that at a comparable point in the campaign eight years ago. 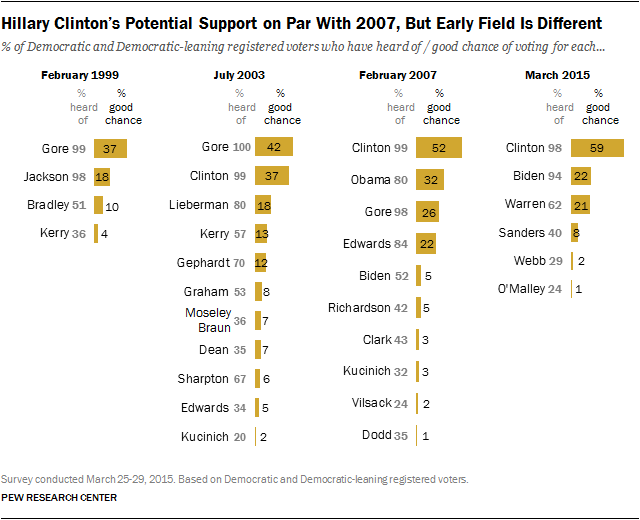 But the Democratic field in 2007 was very different than it is today. 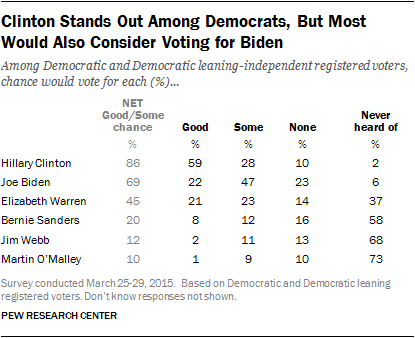 Currently, about one-in-five Democrats say there is a good chance they would vote for Joe Biden (22%) if he were to decide to run and about as many say the same about Elizabeth Warren (21%), who has repeatedly indicated no interest in being a candidate. At about this point in 2007, Clinton, Barack Obama and John Edwards had all announced their candidacies; 32% of Democrats said there was a good chance they would support Obama and 22% said there was a good chance they would vote for Edwards. Long-standing partisan differences in attitudes about political compromise are reflected in views of important qualities for presidential candidates. Overall, 52% of registered voters say it is more important for a presidential candidate to compromise with the other party; 42% say it is more important that a candidate sticks to their core values and positions. 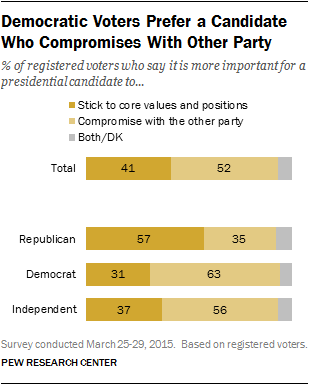 By roughly two-to-one (63% to 31%), Democratic voters value a candidate who compromises. Republican voters, by 57% to 35%, prefer someone who adheres to core values and positions. Large majorities of both liberal Democratic voters (66%), and conservative and moderate Democratic voters (60%), say it is more important for a candidate to compromise than to stick to core positions. Republican voters are internally divided: 64% of conservative Republicans say it is more important for a candidate to stick to core values; just 30% prefer a candidate who makes compromises. Moderate and liberal Republican voters are split (44% stick to core values, 45% compromise). There also are differences among GOP voters based on candidate preferences. Among all Republican and Republican-leaning registered voters, those who say there is a good chance they will vote for Jeb Bush are divided over whether it is more important for a candidate to stick to core positions (48%) or compromise with the other party (46%). Majorities of those who say there is a good chance they will vote for Ted Cruz (75%), Scott Walker (69%), Rand Paul (68%), Ben Carson (66%), Mike Huckabee (61%) and Marco Rubio (58%) say it is more important for a candidate to stick to their positions than to compromise. Republican and Democratic voters also differ over whether it is more important for a presidential candidate to have experience and a proven record or new ideas and a different approach. In general, more GOP voters prefer a candidate who has experience (59%) to one who has news ideas and different approach (33%). 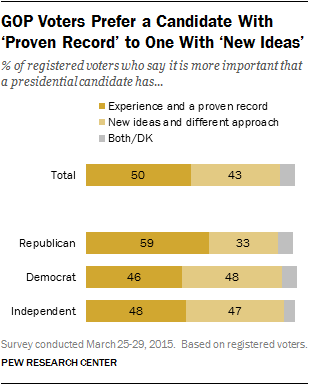 Among Democrats, nearly identical percentages value new ideas (48%) and experience (46%). Age is a bigger factor than partisanship in opinions about the relative importance of experience and new ideas. Voters younger than 30 are the only age group to prefer a candidate with new ideas (56% say this, while 38% say they would prefer a candidate with experience and a proven record). There is little variance in these views among Democratic voters who express a good chance of voting for different candidates. For example, about half (47%) of those who see a good chance of voting for Hillary Clinton value experience over new ideas, as do 50% of those who say there would be a good chance of supporting Elizabeth Warren and 45% of those who see a good chance of voting for Joe Biden. Barack Obama’s approval rating remains divided, with 46% approving of his job performance and 47% disapproving of it. Obama’s approval rating is little changed since the start of the year. But through much of 2014, Obama’s job rating hovered around 44%. As has been the case for much of his presidency, Obama’s personal favorability ratings are somewhat more positive than views of his job performance. In the current poll, a somewhat greater share (51%) have a favorable opinion of Obama than approve of his job performance. 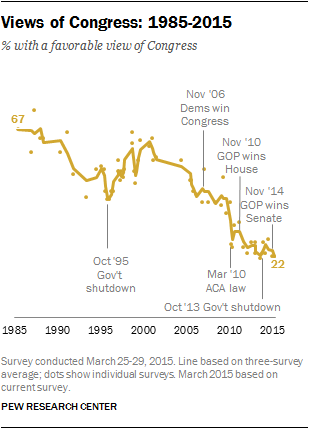 The public’s views of Congress continue to hover near all-time lows. Just 22% have a favorable opinion of Congress — equal to its rating last December — while 72% feel unfavorably about Congress. The share giving Congress a positive rating dropped below 30% in March 2010 – coinciding with the passage of the Affordable Care Act — and has remained there nearly every survey since. 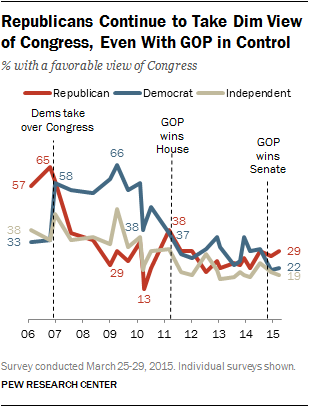 With the GOP now in control of both houses of Congress, Republicans’ views of the institution are only slightly more positive than Democrats’: 29% of Republicans have a favorable opinion of Congress, compared with 22% of Democrats (and 19% of independents). About half of the public (51%) express unfavorable views of Speaker of the House John Boehner, while 22% have a favorable opinion of him (26% hold no opinion). 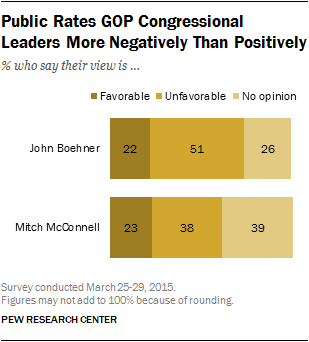 A smaller share of the public has an opinion of Senate Majority Leader McConnell; however, about as many rate him favorably as Boehner (23%) and fewer (38%) have an unfavorable opinion of him (39% have no opinion). In a Pew Research survey last December, the Democratic congressional leaders also received negative ratings. Nearly half of the public (47%) had an unfavorable view of House Minority Leader Nancy Pelosi and 27% were favorable, though Democrats rated her positively on balance. Senate Minority Leader Harry Reid, who recently announced his upcoming retirement, was rated unfavorably by 41% of the public and favorably by 20%. 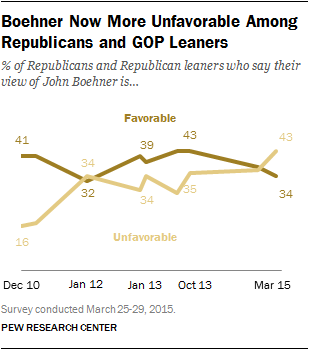 In a change from late 2014, Boehner’s ratings among Republicans and Republican leaners are now more unfavorable (43%) than favorable (34%). Republicans and leaners had rated him either positively or about even in eight previous Pew Research Center surveys since the Republicans won back the House in November 2010.